It'a day 25! Merry Christmas! We spent the day with Randy's side of the family. We had so much to be thankful for with each of our three nephews. Our oldest, Danny, and his wife Keena brought their sweet son. It was the first Christmas in many years with a baby around! We had so much fun watching him. Our middle nephew, Brian, was home from serving in Afghanistan. We thought he was in a hospital in San Antonio being treated for his wounds. He surprised us by showing up at our house for Christmas with his sweet wife Becca. Our youngest nephew, Adam, was also home from overseas. His unit was one of the last to leave Iraq. He and his wife, Nicole, were in North Carolina. Although we didn't get to see them, we are so grateful he is back in the US. We are so proud of all of our nephews. Day 24 is all about Christmas Eve with my side of the family. Shelby got "The Big Bang Theory" board game, and she, Sarah, and Samantha had fun playing it. Those three girls are like sisters. I love how close they are. The rest of us had fun chatting! For day 23, I documented Shelby's ugly Christmas sweater. She always helps with the kid's Christmas choir at church and this sweater has been worn every year. Fun tradition! 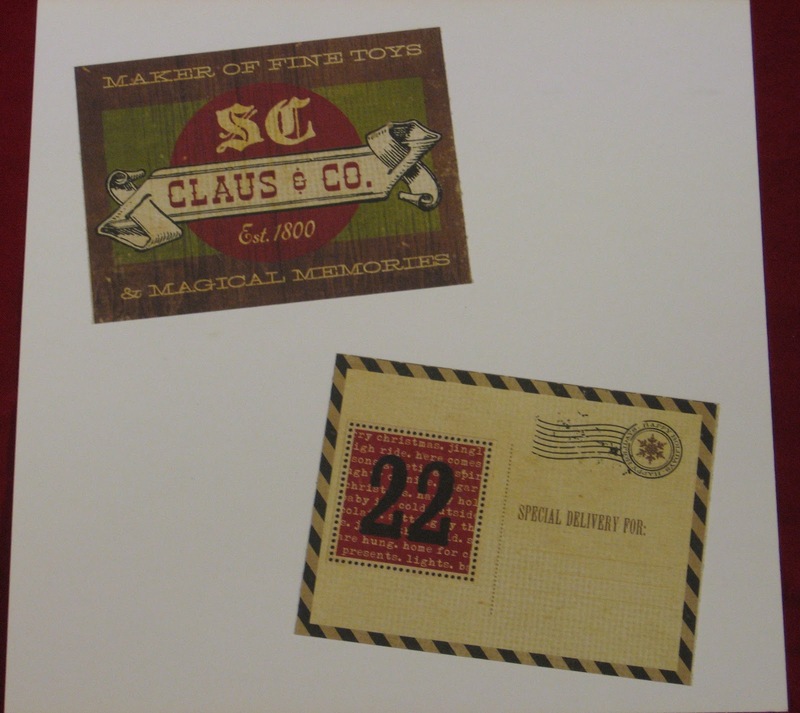 Several December Daily blogs suggested writing a letter to your child to include as part of your album. I thought it was a great idea so I wrote a short note for Day 22! My plans to make this a long letter fell by the wayside as time ran out, so I let it go to move forward. This is something I intend to work on more next year. 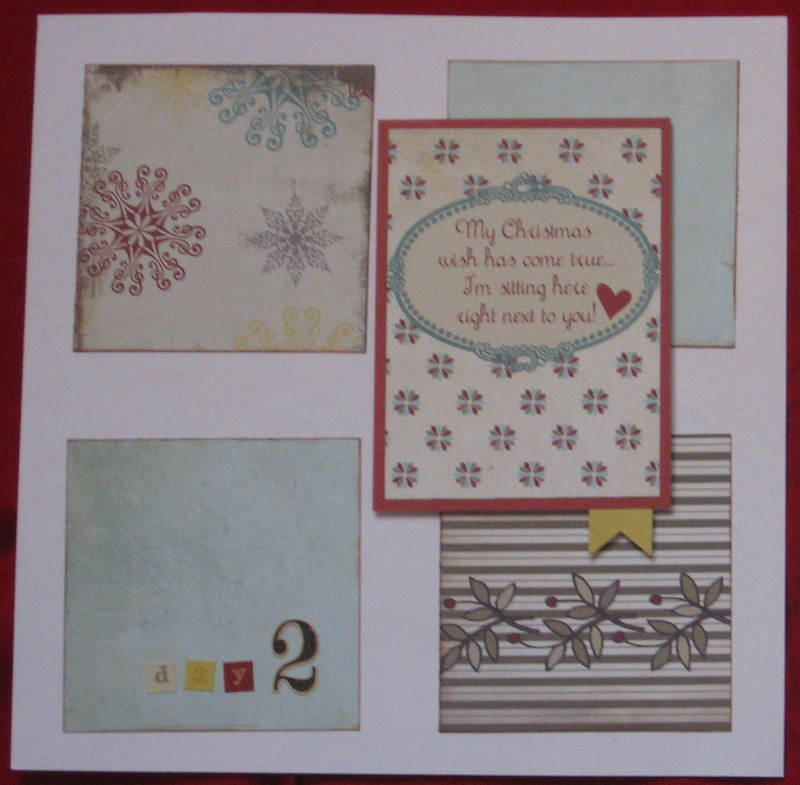 This is the left side of my day 21 layout. 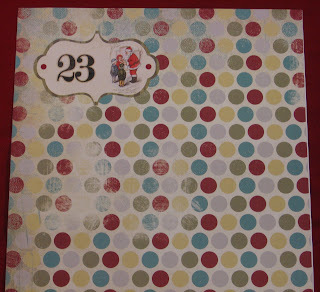 I decided not to post the right side, as I journaled some stuff just for me and Shelby. I'm so grateful to have such a wonderful daughter! 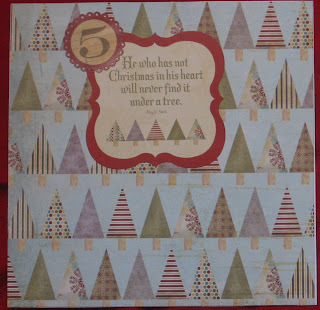 I absolutely love this patterned paper with the trees and giant snowflake. I chose pictures of us just hanging around one evening and chatting in Shelby's room. I really do have the best family! December 19 was the start of my long-awaited vacation. It started off by a fun Christmas party lunch with my team at work which I documented for my December Daily day 19. The plan was to work on my DD during this vacation. Unfortunately, I caught a cold and did not feel like working on anything! 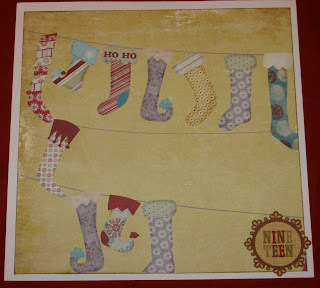 I absolutely love this paper with the cute stockings! For my December Daily day 18, I took pictures of Shelby and I going through stacks of college mail. She has been getting mail from colleges the entire school year, and we needed to narrow the search down. You can tell by her face in the picture that she was not all that into it! Oh well, we made some progress. For day 17, Shelby and I gave ourselves these cute manicures. I did quite a bit of handwriting on this page, and I think it turned out pretty good! For day 16, I included a poem by Max Erhmann. I found this poem on Ali Edward's blog in November and copied it to include in my album. I kept it to use as a "filler" in case I had a day that I didn't have pictures for. This was an especially difficult day for me, my family and friends, and I didn't take any pictures. This picture of me and Shelby is from our vacation in the spring. I was glad to have the poem. December Daily day 15 shows a fun evening with my family watching TV and playing Harry Potter Scene-It. Nights like this are what I was most interested in documenting in this December Daily. The little things that get forgotten over time but yet make our family close. Day fourteen of my December Daily focuses of our Family Night traditions. On day13 I attended our staff Christmas bowling party. I took these photos with my new iPhone. I couldn't resist taking a picture of my lousy score. There is more journaling on the text page, but I blurred it out because it involves the privacy of a friend. December Daily, Day 12, is all about our dog, Albert. I printed out my "10 things I love about Albert" on vellum. 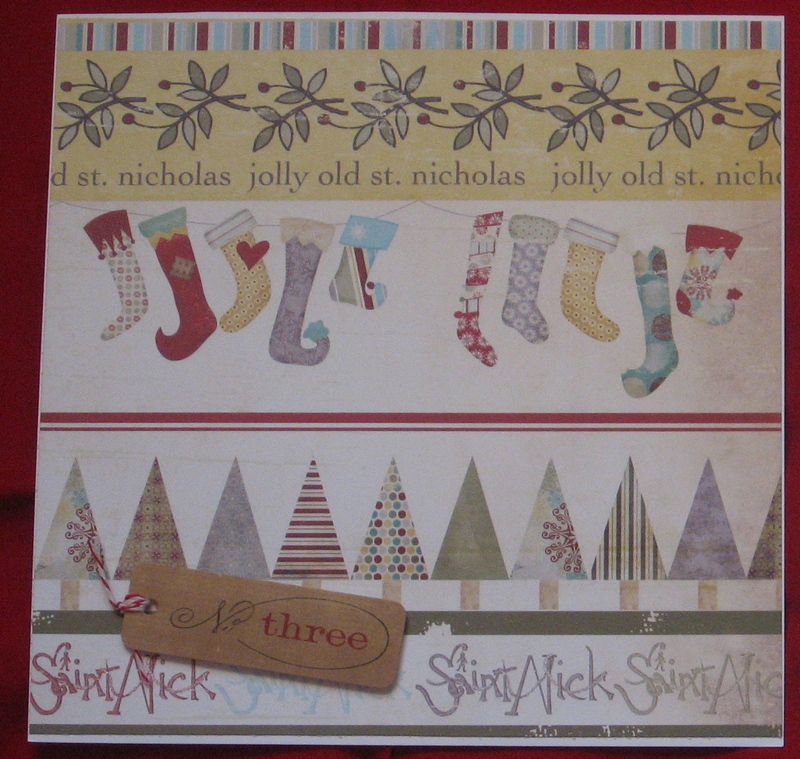 I placed the vellum sheet over the Santa image. I love how the pretty paper shows through the writing. 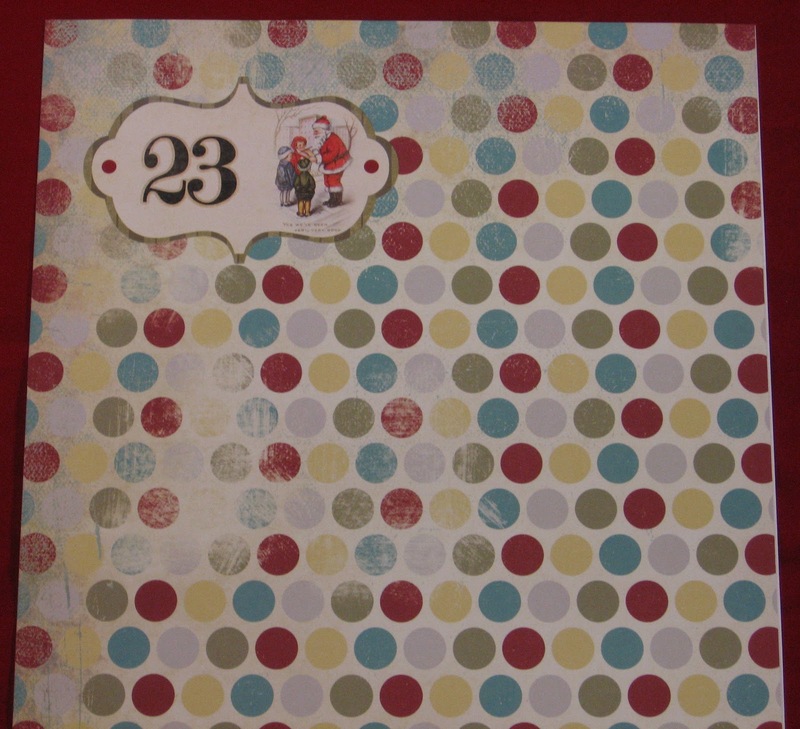 I added some paw print stamping to tie the pages together. Day eleven features random events from the month. I really wanted to take a picture of the full moon in the early morning. The picture on the left side of the layout was the best one. I need to work on night time photography! The moon is stunning in the dark. For the right side of the layout, I talk about a Leader Appreciation breakfast that I organized for volunteers at church. It was fun to make these centerpieces using branches from the big tree in our backyard. 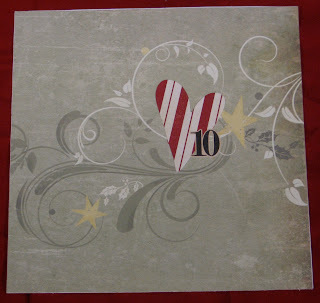 Day ten is my "Ten things I love about Randy" layout. 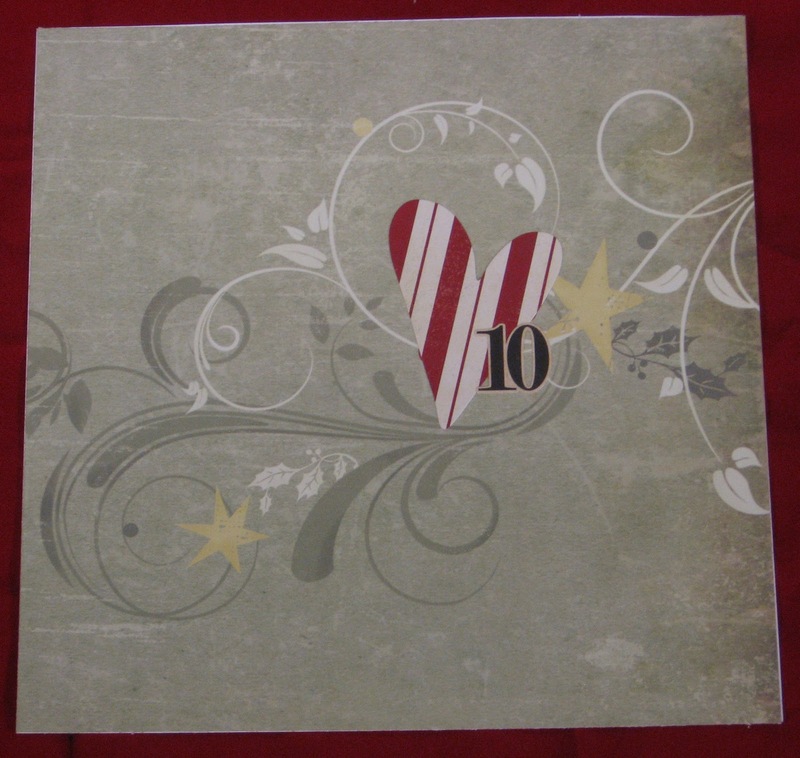 I printed his 10 things out on a 6 x 6 piece of Authentique paper and then cut it down to size. I left the life side of the layout alone, and I loved that I had the huge heart on the page. This time, pre-making the page worked out perfectly. 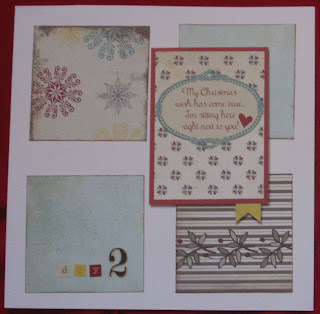 Day nine of my December Daily projects is the beginning of three layouts featuring my amazing family. I was going to start with Randy first; however, the picture below looked better on this background than his picture did. One of the drawbacks of pre-making pages. 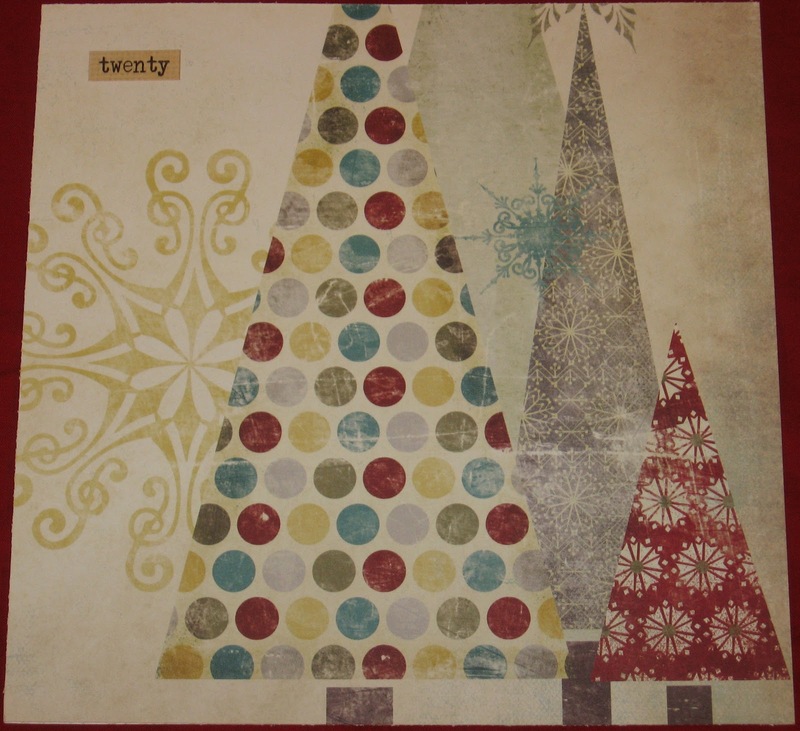 Again, as with all things December Daily, I'm not going to worry about it! I spent time writing things that I love about each person. 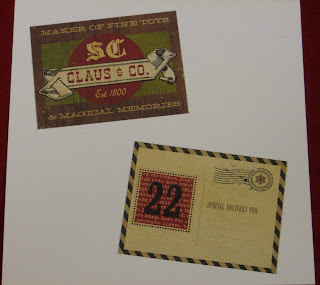 For Shelby's page, I printed each sentence on kraft cardstock and then cut them apart. I love the way that it turned out! I actually like the little bit of handwriting that I did on the page. I took my time, and I think it turned out pretty well. For day eight, I talk about the early morning walks that Randy and I take every day. It's a great way to be sure we get our exercise in before the craziness of the day, and it's a wonderful time to talk and just enjoy being together. Of course, it is a highlight of Albert's day as well! Since it is usually dark outside, I snapped these photos on one of our weekend daytime walks. For Day Seven of my December Daily, I decided to use pictures that depict the fun relationship that Shelby and I have. We have a lot of fun together, and we both have a goofy sense of humor. Shelby and I were playing around with my new iPhone and her iPod Touch, and I took a picture of us "talking" to each other using Face Time. 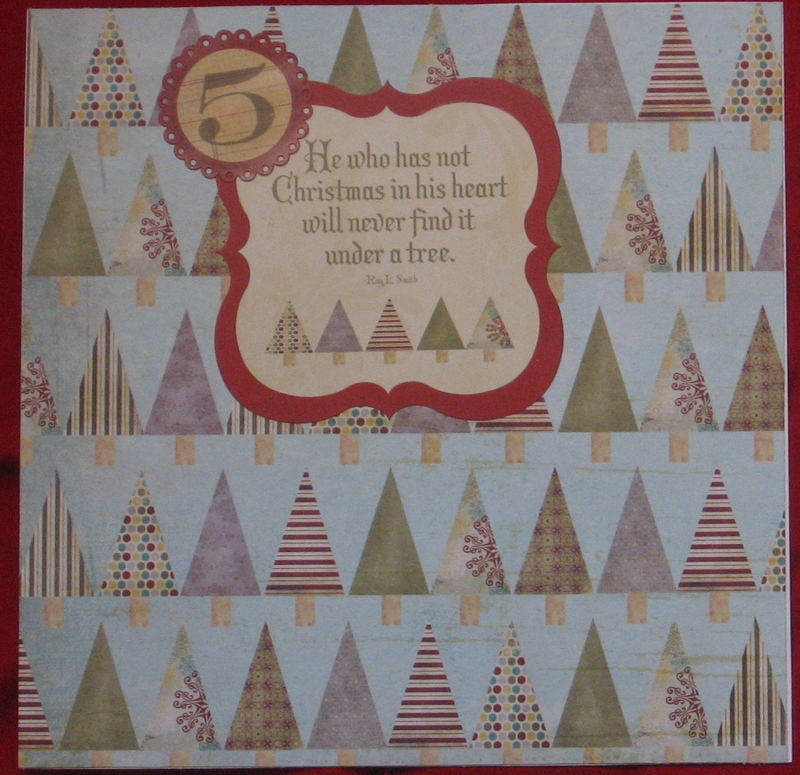 December Daily, Day 6, features Shelby decorating our Christmas tree. She wanted to do it herself this year, and she did an amazing job! It was kind of hard for me to let her, because I like to reminisce over each ornament as I open it. However, it was really sweet to see her do it. Since she was not as eager to pack them away, I was able to reminisce then! LOL! For Day Five, I talk about how blessed I am to be able to work part time. It was important to me to express gratitude that I am able to care for the people I love and participate in activities that interest me. On the text circle, I added some stitching using my sewing machine. Neat technique. I think I will be doing more of it in the future. 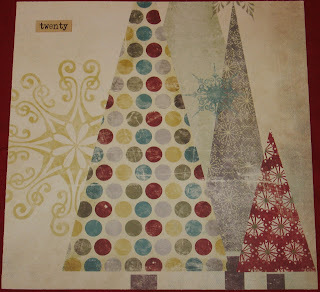 Day four of my 2011 December Daily focuses on decorating traditions. 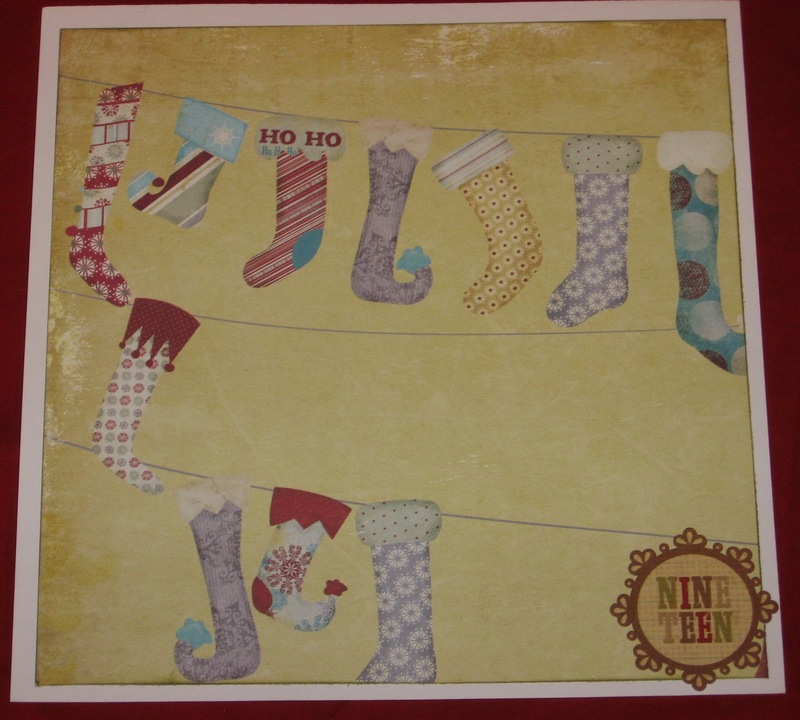 I snapped photos of different decorations around the house and then cut them down to 3-inch squares. I think next year I will focus my journaling on our family's traditions with ornaments. For day three of my 2011 December Daily, I focused on Shelby's acting contest. She has the frown on the lower picture because she had to be at the school by 6:30 a.m. I really do not like my handwriting. This is something to work on for next year. Maybe plan more computer work or practice better writing. For day two of my 2011 December Daily, I documented my new iPhone. I wish I had taken a picture of Shelby with her new phone to add to the page. My intent was to work on each day as it came, but that did not happen! I think if I had done that, I would have realized very quickly that a picture of Shelby was missing. I'm not going to stress over it. It is what it is!! !